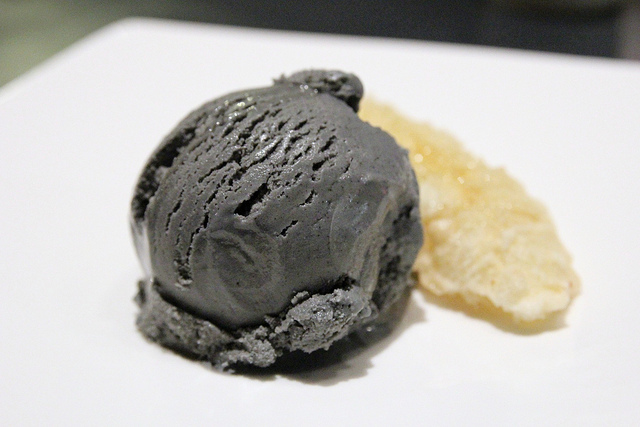 And since I’m miles away from anywhere I could actually buy black sesame ice-cream, I made these. But since I had a can of coconut milk and a bag of black sesames in the pantry, plus a mean hankering for some black sesame ice-cream I thought I’d switch it up a bit. 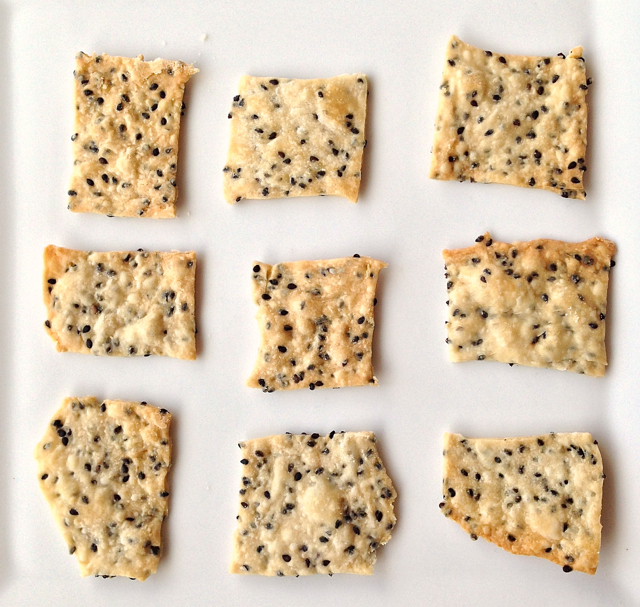 My black sesame and coconut crackers combine the beautiful flavours of nutty back sesame and creamy coconut, with just a hint of sweetness. If you’re into Asian inspired desserts and feel like munching on something a little bit different, than this one is definitely for you! Filled with a good dose of healthy fats and lauric acid from the coconut, and brimming with essential minerals like magnesium and copper from the black sesames; these crackers definitely pack a healthy punch. So say open sesame and sayonara SAOs! these quirky little crackers are sure to get you noshing with joy! 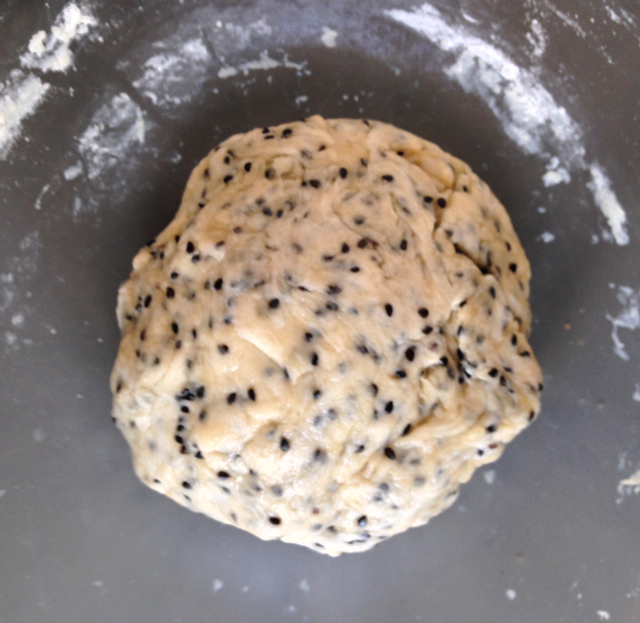 In a large bowl combine flour and black sesame seeds until the sesame seeds are evenly distributed throughout the flour. Melt the coconut oil in a saucepan on a low heat. Once melted remove from heat and stir in sugar until dissolved. Add coconut milk to the coconut oil mixture and stir again. Add this liquid to the flour and stir with a fork to form a dough, gently knead into a ball shape. Divide dough into four portions. Line four baking trays with baking paper (if you don’t own four baking trays or have a small oven, you can roll out and bake the dough portions one at a time). Place the first portion in the middle of the sheet of baking paper and roll out with a rolling pin as thinly as possible (the thinner the crispier). 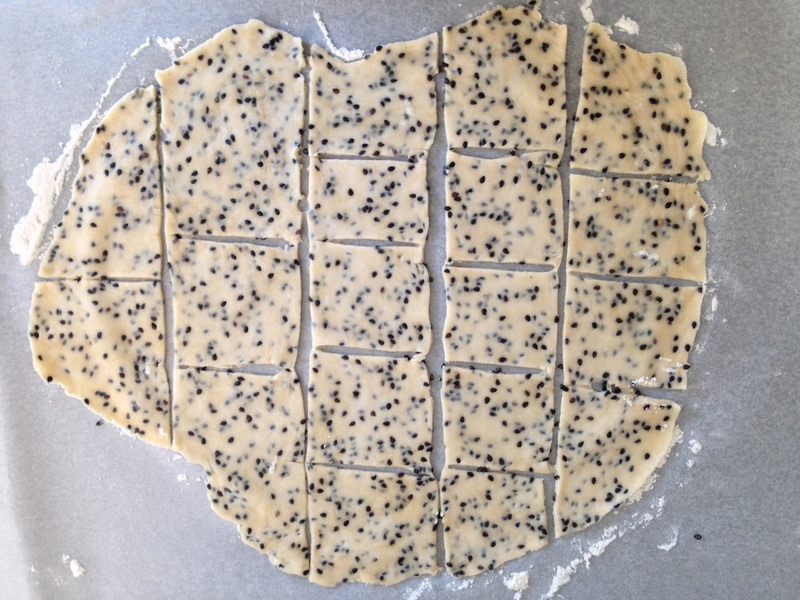 Cut into squares(mine were roughly 3cm x 4cm) the larger your squares the longer it will take for the crackers to brown in the oven. Bake for 10mins or until golden brown(I found it helpful to flip my crackers over at the half way mark). Cool and store in an air tight container to preserve their crispness.